Today I went to Pomeroy Falls in Platte Clove, and did a watercolor sketch for The Sketchbook Project 2012. It was an absolutely beautiful day out there! I'll go back soon to do an oil painting, perhaps from a different vantage point. 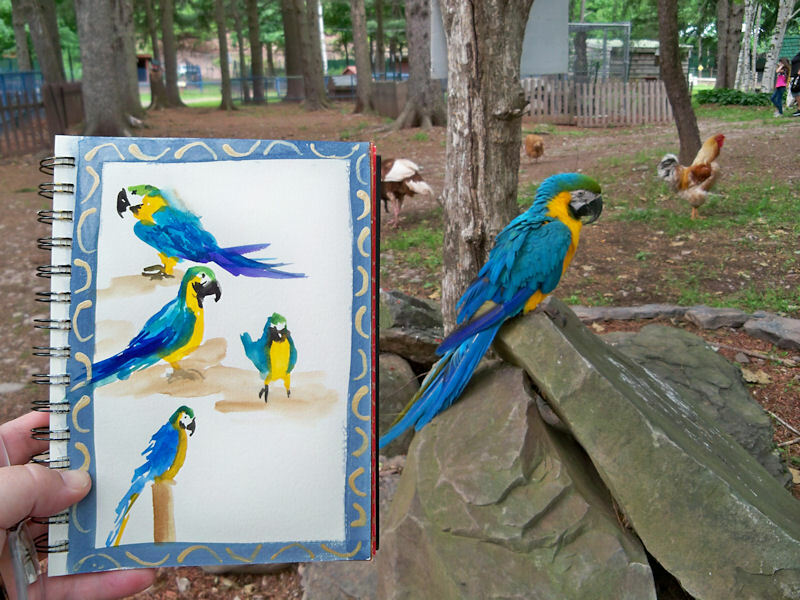 Here's a photo I took holding up the sketchbook, with the scene in the background. There are 15, two-page spreads in the sketchbook they send for this Brooklyn Art Library project, so I'm about 30% done already. I'm thinking that I just might be able to finish before the bitter cold weather sets in, which would be great! I'm a total wimp when it comes to painting out in the cold. 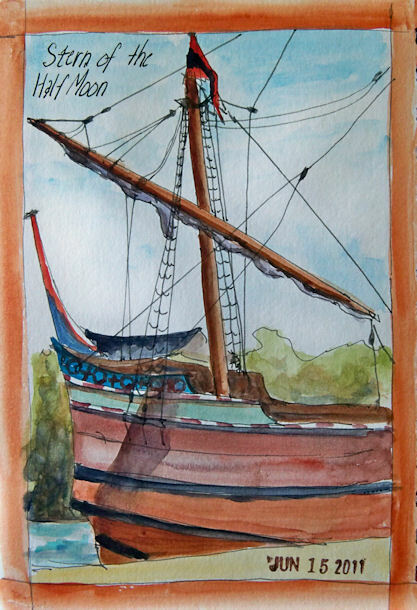 Today I went to paint the replica of Henry Hudson's ship, the Half Moon, but there was no good vantage point for an oil painting of the full ship. So, I painted something else, and then did this little sketch of the stern portion of the ship. 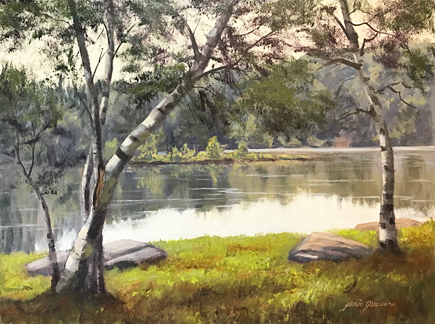 If you're interested, you can see the oil painting I did here. 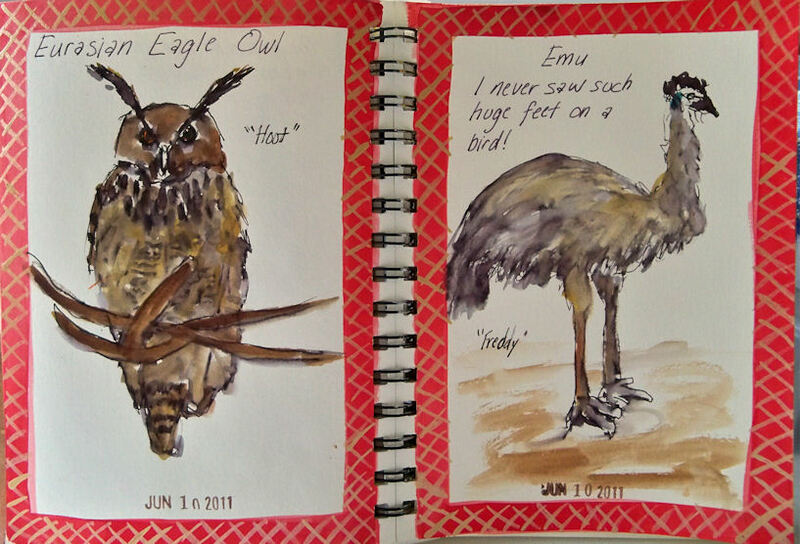 This two page spread features "Hoot", the Eurasian Eagle Owl, and "Freddy" the Emu. 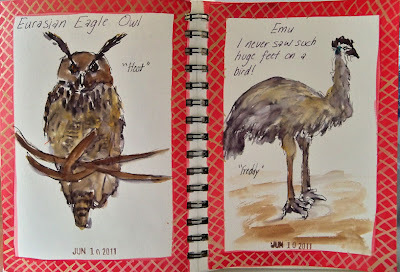 I never saw such huge feet on a bird as that emu has! I guess if you can run 31 mph, you need big feet to do it! This is my favorite border so far, done with red and gold acrylic paint. 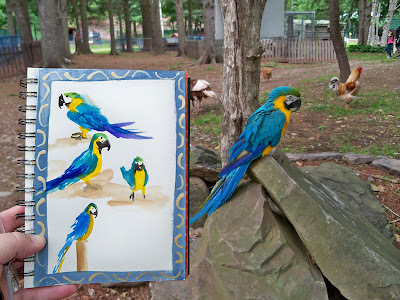 The birds were sketched with ink and wash, and some watercolor added after that for a bit of color. The challenge of sketching the chimps was that they were in the shade and so dark that it was hard to distinguish features. They presented as large, dark masses, so that's how Merlin was sketched! This peacock seemed to be best friends with Tonka, the African Spurred Tortoise. He was in a large, concrete enclosure, and although the peacock could come and go, he mostly stayed. He spread his feathers in exquisite display several times. (My friend Gretchen got a great sketch of that!) Tonka had a wonderfully sculpted shell, with interesting shapes and peaks. Next time I go back, I'd like to do a two page spread just on him. Camels seem to be in perpetual motion, so a portrait attempt was no easy feat. Not only do their heads move continually from side to side, but also from ground level to about nine feet in the air! I'd wait patiently, popping in a couple of lines each time he looked straight at me. Life as an artist is sometimes too much fun to be legal. I had such a great time at the Bronx Zoo a couple of weeks ago that I started wondering if perhaps there was a smaller zoo closer to me. It turns out that there's one only four miles away from my house upstate! 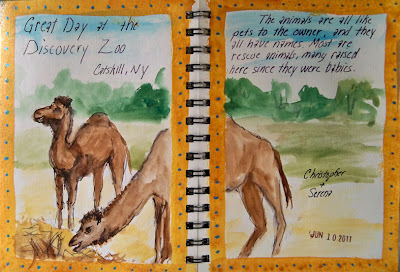 So, today I went with Gretchen to check out the Discovery Zoo in Catskill, New York. 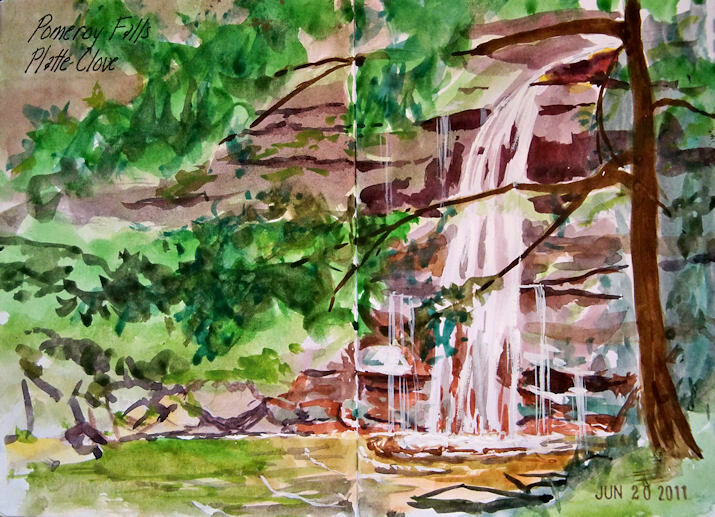 We brought our sketching stuff and bug spray and hoped for the best! The zoo actually exceeded our expectations. 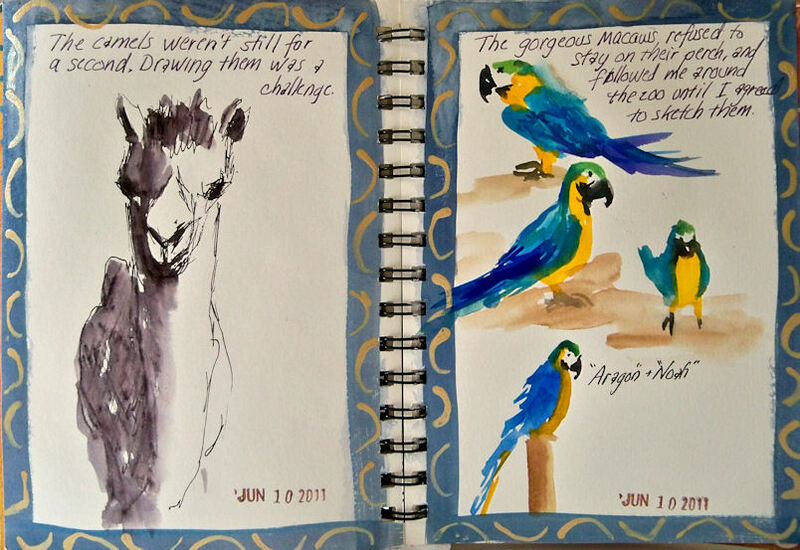 It is small and they don't have a lot of animals, but one can only sketch so many beasts in a single day! 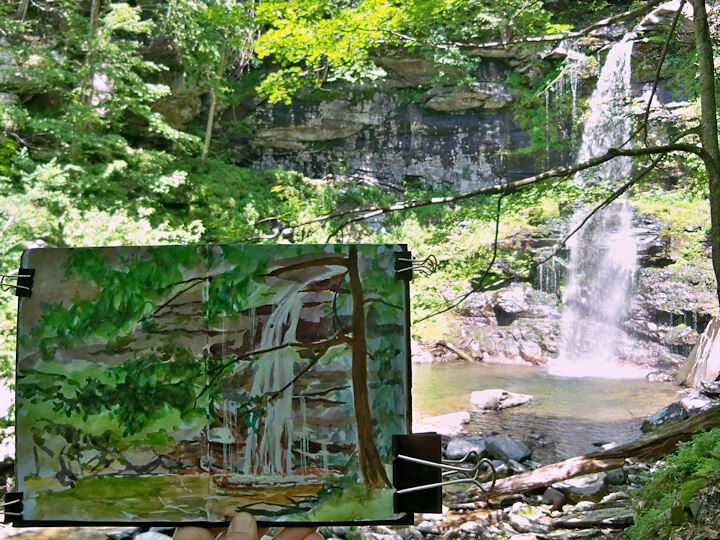 The people were friendly, the habitats were inviting, and we were able to set up to sketch wherever we wanted. There were lots of nice, shady spots, and the owner went out of his way for us, telling us about the history of the little zoo and the names of all his "pets"! These two camels are named Christopher and Serena. They are among the few animals who came to this zoo from the old Catskill Game Farm, which closed five or six years ago. I did a bunch of sketches and got some great photos too. In fact, I had such a good time there that I got a season pass! I figured with it being less than 10 minutes away, I'd surely get there a few more times before the year is out. 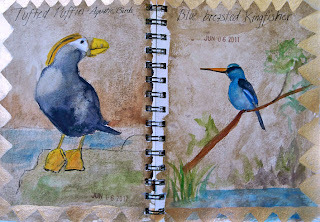 Sketchbook: Stillman & Birn Delta 6x8"
Watercolor, painted across a two-page spread in a 6x8" Stillman & Birn Delta sketchbook. The pages were prepared in advance with diluted acrylic paint. 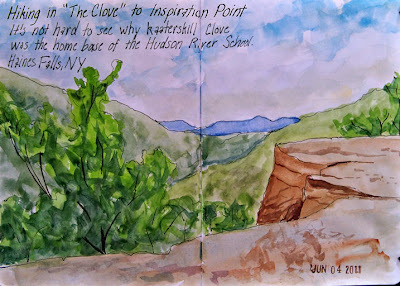 My husband and I hiked out to Inspiration Point, which overlooks Kaaterskill Clove to the east, west and south from South Mountain in Haines Falls, New York. This is the view facing west. When visiting these locations in the northeastern part of the Catskill Mountains, it's easy to understand why the Hudson River School Painters made this area their home base. The land speaks to you here, and you can feel the presence of all who came before you and admired its beauty. This is another sketch in my "Travel With Me" book for the Brooklyn Art Library's "Sketchbook Project 2012". If you're interested in ink and wash materials and techniques, check out my guest blot post today for the Goulet Pen Company on their Ink Nouveau blog site! 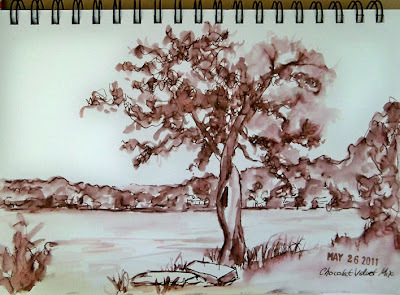 I sketched this last week at the lakeshore using a combination of Private Reserve Chocolat ink mixed with about 25% Private Reserve Velvet Black to cut the red a bit. After doing a line drawing, a waterbrush was used to form the midtones and shadows, using ink from the lines. 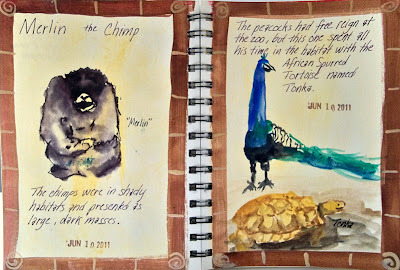 The paper is a Stillman and Birn Beta sketchbook.